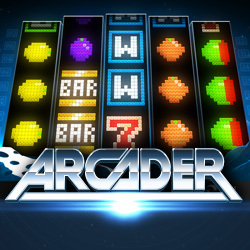 Arcader online slots casino game has a space invaders theme with the slots appearing to rise from the foreground into the dark skies background beyond where planets revolve, meteors fly passed and stars twinkle. If you’re lucky enough to make a win, you’ll see shooting stars in the background. Swedish game developer, Thunderkick has offices in Stockholm and Malta. Since 2012 they’ve provided simplified but engaging game experiences that look and feel different and which you won’t be able to forget. Arcader online slots has a 5 reel, 3 line, 15 fixed payline format. There are pixellated fruit symbols - cherries, oranges, plums are at the lower end of the paytable moving up through lemons and watermelons – to bells, the number 7 and the word BAR at the high end of the paytable. Click the hatch symbol (bottom left) to view the rules (document symbol) and paytable (prize cup symbol). Click Bet at the base of the screen to select the value of the coins you want to bet. You can set up to play auto by clicking Autoplay and selecting the number of spins you want. Or you can spin manually one spin at a time by clicking Spin. PIXELATED W – substitutes for any symbol but the bonus, mystery and expander symbols. PIXELATED W (BONUS) – aka sticky wild - substitutes for all other symbols in the free spins bonus. PIXELATED UP/DOWN ARROWS – expands to fill all of the reel maximising payline potential. PIXELATED B – Three or more trigger the bonus game plus 9 free spins. Three gives a x1 multiplier, four x3 and five x9. PIXELATED M – Three or more trigger the mystery game plus multipliers. Three gives a x1 multiplier, four x2 and five x6. Triggered by three or more bonus symbols, you get 9 free spins and a multiplier. For three bonus symbols this is x1, for four it’s x3 and for five x9. For each free spin, you’ll be given a sticky wild in reel 2, 3 or 4, and it will stay there for the duration of all the free spins. Triggered by three or more mystery symbols, all the symbols on screen turn into question marks and you get to pick them in whichever order you want to reveal an amount. The amounts are added together and the game isn’t over until you pick the blank symbol (x). Your win is multiplied x1 if the game was triggered by three mystery symbols, x2 if triggered by four or x6 if triggered by five. There’s a retro feel to the pixelated icons, steady theme music and the voice encouragements received along the way – Nice, Expansion, Great, Double Expansion, Awesome – and the icons flash neon style to highlight what’s combined across the lines. If you ever played Pacman you’ll relish the pixelations and thoroughly enjoy this game.